News Flash: Box o’ Books, Bestsellers, Radio Shows, and Launch Events! Congrats to Karen A, who won a signed copy of FOAL PLAY and MURDER ON THE HOOF from Kathryn O’Sullivan! 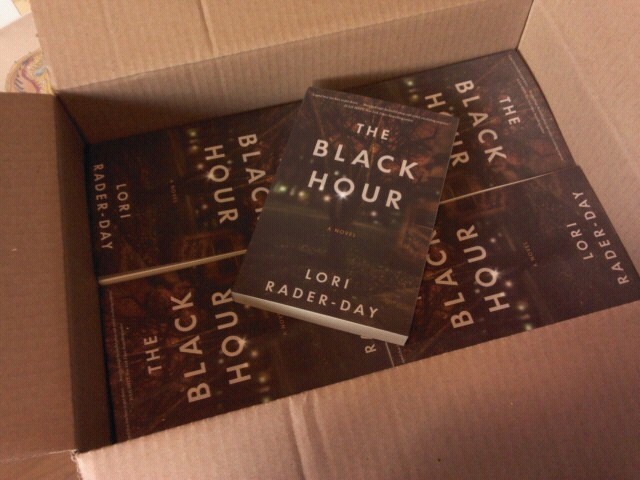 Lori Rader-Day received a box of THE BLACK HOUR! The cover is kitten-soft. They aren’t on sale until July 8, but production was moved up so that she’ll be signing them (and giving them away, natch) at BEA in New York at the end of the month! Natalia Sylvester is so excited to announce two launch events (one in Austin, one in Miami) in June! And she’s teamed up with local indie The Book Spot, where signed, personalized copies of Chasing the Sun are now available. Heather Webb enjoyed a great night with a local book club this week, drinking wine, nibbling on delicious treats, and talking Josephine. They may love her *almost* as much as she does. Almost. Remember Lisa Alber‘s high school reunion last weekend? Well, she reconnected with one of her classmates, Brian Crow, a radio show host, who invited her to talk about KILMOON and writing this week on his show. Talk about serendipitous and trippy! It may not be listed yet, but it’s Eat Crow — Episode 7. Also available as a podcast. Susan Gloss learned from Publishers Marketplace that the ebook of VINTAGE broke onto the Amazon Bestseller list this week!